Are The Paul Krugmans Of This World Setting The Stage For Higher Commodity Prices That Will Crush The US Recovery? For some time now, the U.S. government, business leaders, and top economists have been trying to pressure China into allowing its own currency, the renminbi or yuan, to gain value versus the dollar. The thinking is that a higher yuan would make American products more competitive. Meanwhile, China has been cautioning the U.S. that a free-floating yuan could result in a lose-lose situation in which both economies would be damaged. We think our government should be careful what it wishes for. In particular, the U.S. should consider that China may be much more right about the U.S. economy than its own economy. 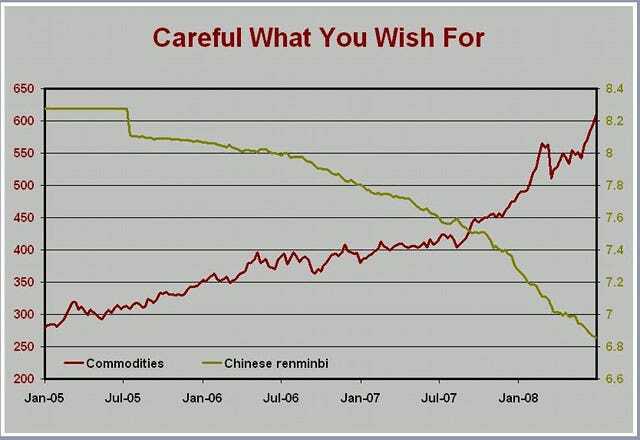 Let’s assume for the moment that the Chinese want the yuan to rise but know that a higher yuan will create havoc in the developed world. Being highly intelligent, the Chinese know that they shouldn’t unilaterally let the yuan rise. If it did, China would be blamed for the fallout. Just like the hustler who wants the mark to feel like a victim of his own greed, China wants the revaluation of the yuan to look like an act of reluctant self-sacrifice which it does to appease U.S. demands. It will look like self-sacrifice, thanks to people like noted short seller Jim Chanos, who maintains that China’s economy is weak and its markets are in a bubble. By this line of reasoning, a higher yuan would take away China’s competitive advantage, ending its miraculous growth. Frankly, we believe that eventually all the statues of Chairman Mao in China may be replaced by statues of people like Chanos, because their opinions are the misdirection that will let China rise to world dominance. The classic Chinese book, The Art of War, states that when you are strong, you must always make the enemy think you are weak. So today, China is much stronger than most people realise. Contrary to the spin, a higher yuan will benefit China and harm the U.S. 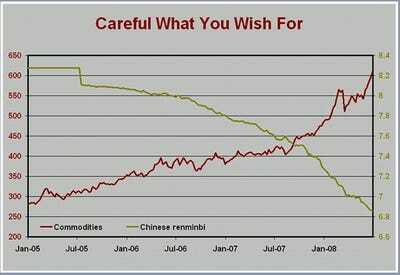 Consider what happened after July 2005, the last time China let the yuan rise. Commodity prices across the board rose more than 100% until their peak in 2008! Anyone who thinks that another such spike in commodity prices would be good for the U.S. economy needs to take an early retirement. The last one led to the recession and 10% unemployment. This time around, everyone is underestimating China’s economy and its future need for commodities. But they’re wrong. China’s need for commodities has, if anything, been growing. China has embarked on a program to build an alternative energy infrastructure which will require massive amounts of every industrial material. A higher yuan will be a blessing, since it will allow China to buy these materials around the world for less. If anything, China will be able to manufacture products for lower relative costs than now. And so how in the world will that help U.S. exports.